Gloucester County offers 4‑H clubs that encompass a wide variety of interests! Click on "4‑H Project Clubs" for more information. 4‑H Youth Development develops programs and activities designed to provide youth with life skills such as public speaking, leadership and citizenship. This is accomplished through a variety of delivery methods: 4‑H Project Clubs, School Enrichment activities, short term educational events and 4‑H Day Camp programs. The youth enrolled in 4‑H clubs learn about specific subjects. Examples include small animal care, horsemanship, raising and managing livestock, nature and science. 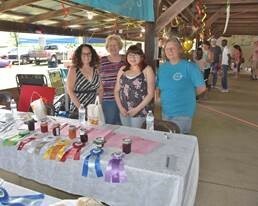 Each July, the 4‑H program in conjunction with the 4‑H Fair Association sponsors the Gloucester County 4‑H Fair. At the fair, 4‑H members are given the opportunity to display and demonstrate the projects they have worked on throughout the year. Other programs sponsored by the 4‑H Youth Development program are Senior Council for middle to high school 4-H members, Fall Festival, Public Presentations, STEAM activities and programs on character education, skin cancer awareness and nutrition. 4‑H members also participate in regional, state and national 4‑H events and opportunities such as SJTC, State Presentations and Citizenship Washington Focus. Gloucester County 4‑Hers have a long history of receiving state and national recognition for their skill and talents. 4‑H is open to all Gloucester County youth free of charge regardless of race, religion, age or disability. For more information, call Rutgers Cooperative Extension of Gloucester County at 856-224-8040.